Welcome to the website for the King Street Volunteer Fire Department, Engine Company 14. 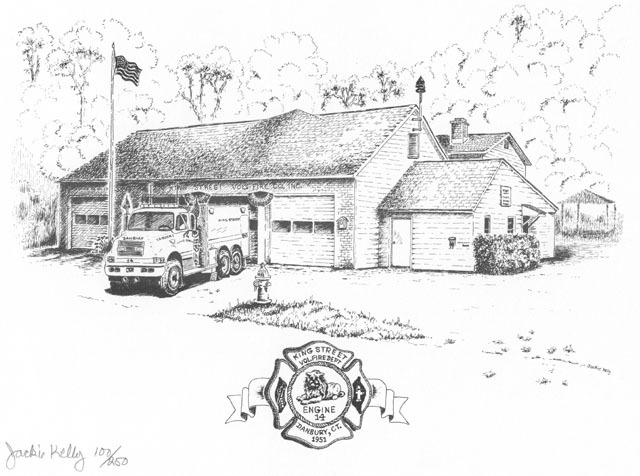 The King Street Volunteer Fire Department is located in the Northwest corner of the City of Danbury in Connecticut. We are one of 12 volunteer fire companies in the City of Danbury and we also support 6 career fire companies in the city. King Streets first due response area is the largest of all the fire companies and covers apporximately 9 square miles. The response area runs from the New York State Line as the Westernmost border, to the New Fairfield, CT Town Line as the Northernmost border, and Candlewood Lake in Danbury as the Easternmost border. On an annual basis the King Street Volunteer Fire Department responds to an average of 180 fire calls. These calls range from structure fires, vehicle fires, and brush fires to pump outs, wires down, automatic fire alarms, and various other rescue calls. King Street also provides mutual aid emergency response to surrounding towns including the Town of New Fairfield, CT and the Town of Brewster, NY. The King Street Volunteer Fire Department has been active since 1951 and has approximately 75 members consisting of both active firefighters and non-active social members. We are always looking for new members on both the firefighting and social levels. Interested parties should contact the fire department by phone, email, or the reply card found in our annual fund drive mailings.